There’s nothing so endearing as tiny babies folded into tiny positions. 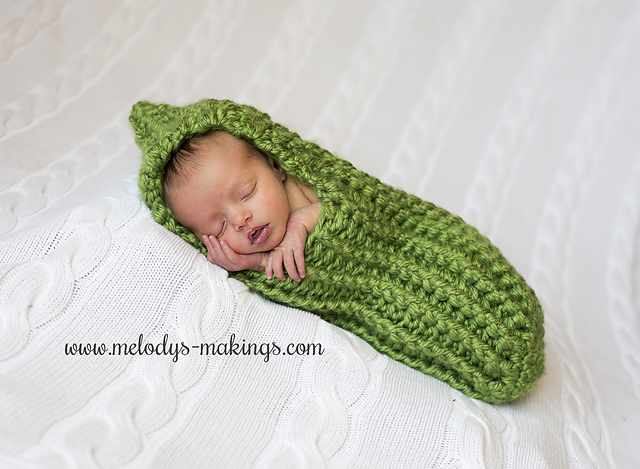 This adorable pea pod style snuggle sack will keep your little one all cozily wrapped up in those first few weeks. Forget the swaddle and slip baby into this cute newborn cocoon. It’s also perfect as a newborn photo prop. This cocoon comes in one size suitable for an average size Newborn under 2 weeks of age. It is designed for a very snug fit around the baby, and although it does have lots of stretch, it will not fit babies over 9 lbs. This pattern calls for Size 10.0mm (N/P) Crochet Hook and Super Bulky (6) yarn. Create a Magic Circle with 6 Single Crochet sts in the center. Repeat Round 7 until your piece measures approx. 11.5 inches (29.25cm) from round 7. Fasten off. Cut yarn, and weave in all ends. You will now start working in rows. Pick up a new strand of yarn and count 15 sts from the center back (previous seam). Work the first stitch of Row 1 into this stitch with outside facing you. Slip stitch into the stitch next to this one to connect your yarn, CH2, then start Row 1. Repeat Rows 1&2 until your piece measures approx. 6 inches (15.25cm) from the point you started working in rows. Turn your project inside out. Fold your hood in half and line up the two sides so the stitches are matching. Seam up the top of your hood by Single Crocheting the two coordinating sts from each side together. Fasten off. Cut yarn and weave in all ends. Turn project right side out. Omigosh. This is adorable. If ever my boys decide to get married and have children… Seriously, so cute. baby showers and newborns I know.